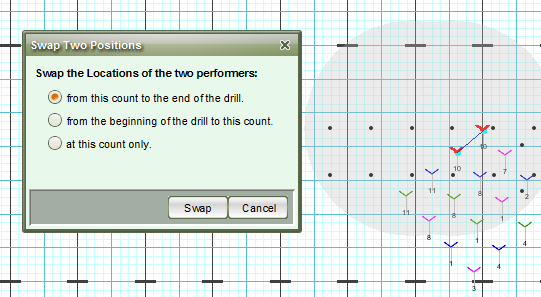 From this count to the end of the drill – the selected performers will switch positions at the count your Primary (red) Anchor is located at on the Count Track, and apply to every count after, until the end of the drill. From the beginning of the drill to this count – the selected performers will switch positions from the beginning of the drill up to the count where your Primary (red) Anchors is located at on the Count Track. At this count only – the selected performers will switch positions on the count where your Primary (red) Anchor is located on the Count Track. Press Swap in the window to commit the change.